(P1) It takes GUTS to sell everything you own and begin sailing around the world. (P2) But that’s exactly what Matt and Jessica Johnson did when they realized they were spending too much time in front of the TV. (P3) Instead of taking up yoga or JOGGING, the change they OPTED for was RADICAL. They sold their house, learned to sail, and began an EPIC adventure at sea. (P4) Their blog DOCUMENTS every step of their journey. (P5) Before beginning their adventure, neither Matt nor Jessica had ever SET FOOT on a sailboat. (P6) Matt was a successful sales manager at a car dealership and Jessica was a billing specialist for an auto INSURANCE company. (P7) After spending three years learning how to sail, they sold their house and left everything they knew. (P8) So far, they’ve explored 16 countries, traveling from New York City to Peru. 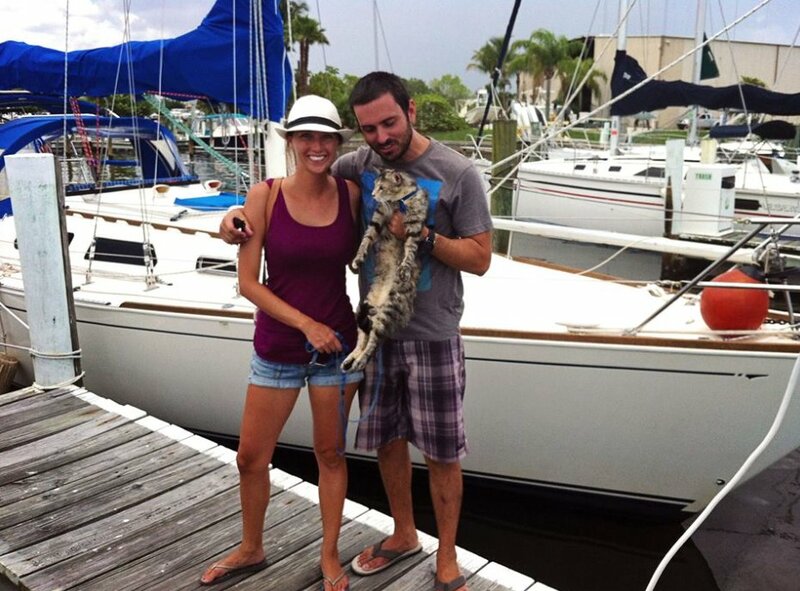 (P9) In 2012, the couple ADOPTED a cat named Georgie to join them on their travels. Matt, Jessica, and Georgie all seem to THRIVE on the MARINER lifestyle. (P10) Georgie, “loves sitting on the deck and watching the fish over the side of the boat when we are at ANCHOR,” Jessica told the Daily Mail. (P11) Georgie is attached to a leash for safety reasons unless the boat is anchored. (P12) But this SEAFARING cat can swim! When the couple traveled to the Grand Cayman, Georgie jumped OVERBOARD, swam around the boat, and then climbed back on it. (P14) Here’s the most amazing part — the traveling couple is still supporting itself from the savings they built when they sold their house, car and other belongings. (P15) They live FRUGALLY, PINCHING PENNIES to make their savings last. In 2014, they spend only $12,619.19. (P16) They document all of their expenses on their blog so that others who are thinking of exploring the world by sailboat will know how much it will cost. (P17) This ADVENTUROUS couple hopes to continue on their journey for as long as they possibly can. (P18) They’ve heard too many CAUTIONARY tales “from so many others that had been PUTTING THEIR DREAM ON HOLD until retirement.” The Johnson family is determined to explore the world while they are young. Would you like to GET AWAY FROM IT ALL like this couple? Do you save a lot of your earnings, or do you spend everything you make? If you could travel anywhere in the world, what places would you like to visit? Do you think that the Johnsons will eventually go back to corporate jobs, or not?